While this might be the shortest clip we've ever featured, I think it's more than worthy. In Nightcrawler, Jake Gyllenhaal plays Lou Bloom, a thief who develops a taste for late night freelance photojournalism. In this teaser alone, Gyllenhaal is fantastic. He manages to be charming, creepy, and frighteningly intense in less than a minute. If his character seems like a "hungry coyote", that's exactly what he was going for. Obviously central to this teaser is his speech. Gyllenhaal apparently memorized the entire film like a play, which, I guess you'd have to if you've gotta say this particular spiel over and over again. The teaser itself is special - it's got footage of his speeches from the movie, but it also has some stuff shot just for the teaser. He never sits behind the news desk like that or talks directly into the camera. After seeing this teaser, you just have to wonder what the hell this movie is. It does a great job of hinting at the kind of demented tone but doesn't tell you too much. Gyllenhaal would go on to win awards and nominations for his role and director and writer Dan Gilroy nabbed an Oscar nomination for the screenplay. 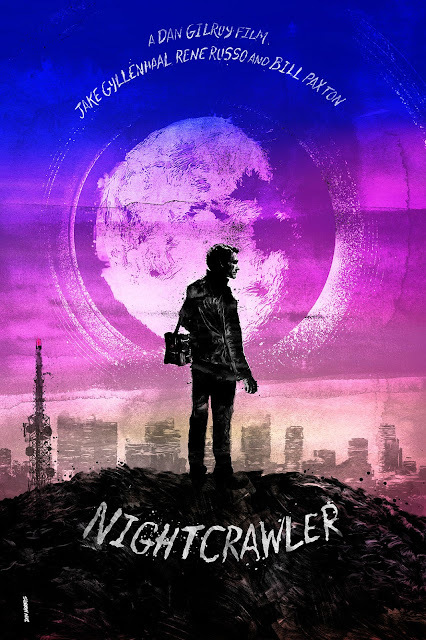 What's your favorite scene from Nightcrawler? The movie is 10 times better than the trailer. No one could have played Louis Bloom better than Jake Gyllenhaal. He did an outstanding job. HE SHOULD HAVE WON THE OSCAR DAMMIT!